We now have the technology to reach nearby planets. Even though many long-term technical issues still need to be solved to create the conditions for a permanent, self-sustaining human presence on another planet, imagining humans as a multi-planetary species is no longer mere fantasy. 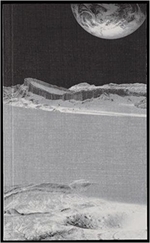 Against this backdrop, the publication Planetary Echoes focuses on our imagination of life on other planets in the arts, literature, and sciences at the beginning of the 21st century, attempting to integrate the discourse into the very fabric of society today and connect artistic research and the abstract theoretical sciences on an international level.